According to the remaining archive data, in 1937-1938 during the mass political repressions at least 3776 people were executed by shooting and secretly buried in the environs of Petrozavodsk. One of the clandestine NKVD burials (approximately 350x150 metres in area) is situated in the "Krasny Bor" wood, 19th km of the Petrozavodsk-Voznesenye road (4 km before Derevyannoe village). From August 9 to September 15, 1937 (Travin's execution platoon) and from September 26 to October 11, 1938 (Goldberg's execution platoon) at that place 1196 people were executed: 580 Finns, 432 Karelians, 136 Russians and 48 people of other nationalities. The inhabitants of Derevyannoe village have always known about the executions which had taken place somewhere in the woods. Only in 1997 after searching for many years the inhabitants of the village, father and son Ivan and Sergey Chugunkovs managed to find the depressions in the soil characteristic of the places of mass burials. Juri Dmitriev headed excavations, which began in October 1997. The excavations added some details to the events that had taken place. First of all, empty bottles of vodka, which the NKVD officials had drunk after and, perhaps, during the executions, were found. In the pits the bodies of the executed convicts lay in stacks. All the skulls had a typical hole on the occiput, some of them had even two holes. October 31, 1998 the Memorial Cemetery "Krasny Bor" was opened. October 30, 2006 the monument of the Juri Dmitriev was unveiled. On plates – the citation from the Gospel "Blessed are those who mourn, for they shall be comforted" (Matt.5:4) by Russian, Karelian, Finnish and Vepsian languages. The monument is built using money collected by relatives of people buried here. 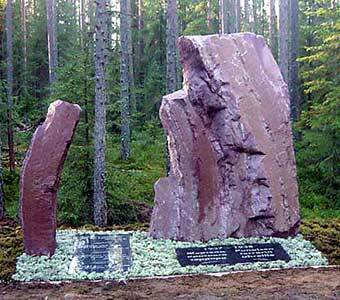 Another famous burial of the victims of the mass political repressions of the end of 1930-s is the Sandarmoh wood close to Medvezhjegorsk. Special Thanks to State Centre for the Protection and Management of the Historic and Cultural Monuments of the Ministry of Culture, the Republic of Karelia for the help in gathering materials for this page.